About: Tipsy Toad is an off licence selling a variety of wine, beer and spirits. They also sell cigarettes, lighters and newspapers, and has a grocery section which sells sausage rolls and freshly made sandwiches. They also have a pay point. This is the place that I visit on a daily basis. Love this shop, it's family owned, making you feel so welcome. The products they sell are so carefully chosen and all organic. Just love going there. Super-friendly and helpful owner, very good range of products: organic, diary, wines etc. definitely recommend. I love the Tipsy Toad, always happy to help, and a vast variety of organic food products - Great if you can't have diary products or gluten. 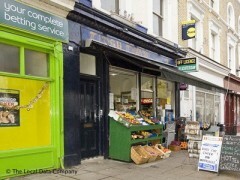 Great local convenience business serving the needs of the local community. Warm and friendly proprietor.